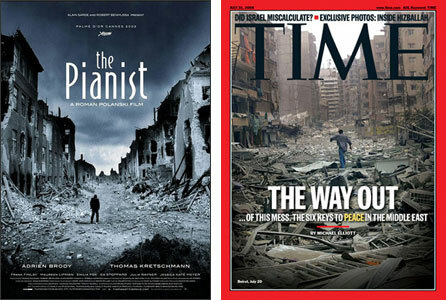 Over at McSweeney’s, Lawrence Weschler sees echoes of one of the marketing posters for The Pianist in Time magazine’s Beirut cover. He writes: “One might start by wondering whether the Polanski image wasn’t just so powerfully iconic that it all but manhandled the art directors at Time into choosing that Beiruti image over all the others that came across their desk that day for their cover.” Actually, a different poster was more widely used in the U.S., although this was a central image in the movie. Weschler specializes in these sorts of “convergences.” His latest book, Everything That Rises, is a collection of them. He also knows Polanski well, having written a long profile of him years ago that was recently republished in his book Vermeer in Bosnia.